I am so thrilled that there is a female protagonist who loves theatre and isn’t dying to be onstage. Callie is a great role model for pre-teens and teens alike as she is the master of her own learning of stagecraft in order to help put on the school production of Moon over Mississippi. She encounters some very mature problems of how to work through her own limitations. She is also introduced to a couple of brothers who are new at the school and they teach her about making new friends. Telgemeier is able to call attention to the young character’s budding sexuality, openly recognizing that one of these characters are gay, without making it dominate the rest of Callie’s own story. The struggle she experiences is emphasized through the organziation of the novel into Acts, mimicking the structure of a play. I would recommend this book for students as young as grade 5 as long as they understand that it essentially explores ideas of romance. As a teacher, I think it could lead to some very real discussions with students who are confronted with the ideas of homosexuality for the first time in a school situation. I applaud Telgemeier’s bravery for writing this book. It’s not just a brave book…it’s a funny, endearing book about the awkwardness of first love. I think my favourite thing about the main character, Maggie, is that her personality is so well-developed. 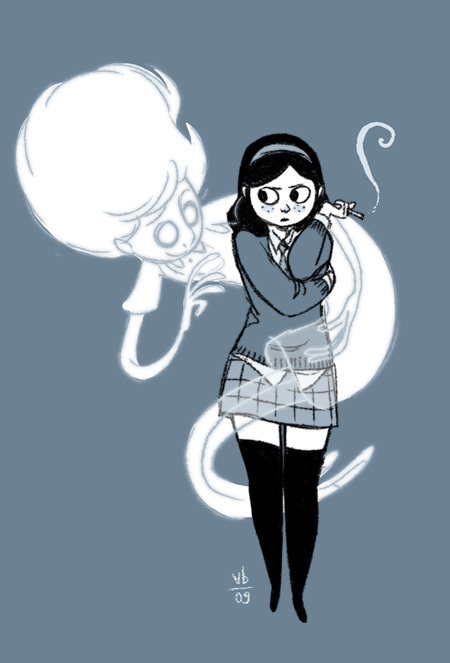 Before the ghost is even introduced we find out that: she’s the only girl with 3 brothers, her Dad has a new job, and her Mom has left the family. Besides all the other normal angst that goes with being a teenager, she’s starting her first day of regular high school after being home-schooled her whole life. The jacket is very well done and I think the description:”… and, oh yeah, she’s haunted.” is sure to appeal to readers in my library. I also really like how the main conflict in the novel is really approachable for all teens: new friends, learning the grey areas of right and wrong, and, oh yeah, how to put a ghost to rest. Ok, maybe not that last one. Maggie’s brothers are also well-developed and have distinct personalities especially Zander who is both wise and immature. With all their cavorting about it makes me wish that I had brothers too. Comics in prison libraries? Huh. In this article Martha Cornog, longtime reviewer for Library Journal, interviews Graterford Corrections librarian, Philip Ephraim, about the inclusion of comics in his prison library. Ephraim talks about the circulation statistics of comics noting that they are a small portion of the collection but well-used by patrons. As a result, Ephraim has observed an increase in patrons choosing more serious reading materials and becoming interested in the art of comics. Some of the appeal to the library patrons includes using them as reference or springboards for artwork and this has lead to the development of how-to draw books in the collection. Likewise, the drawing leads to the need to articulate dialogue in the creation of comics and so the study of writing has also increased in library patrons. Most importantly, comics are signed out for entertainment which has a significant effect on the stress levels of the inmates, which in turn translates to pacifying the atmosphere of the correction facility itself. Ephraim leaves the reader with a series of questions about the relationship between his inmate patrons and comics that he advocates should be researched. He wonders if there is a relationship between intelligence or reading levels and comics and how it can be measured. He is also curious about if the prisoners admire the characters they read about and wish to emulate them by performing good deeds. Ephraim is trying to gather more data to persuade others that comics should be included in every prison library. The interview with Ephraim about his prison library collection of comics and prisoners’ reactions left two lasting impressions of the dynamic in my mind: the increase in the pursuit of art-making and the questions of morality in comic book themes. I can only assume that one of the factors that contributes to incarceration is illiteracy. Certainly any kind of reading material that the inmates choose increases their exposure to text and the likelihood of reading activity. While Ephraim agrees with current research that shows that reading comics can lead to higher literacy rates, his inclusion of comics seems to validate the reading decisions of his unique patrons. Perhaps this is why they choose the creative act of art-making, rather than the destructive behaviour they’ve shown in the past. This creation in itself empowers the same library users to ask for materials that they are interested in. Having Ephraim purchase more texts that users request demonstrates that their interests have sway as the library collection is adapting to the users, rather than the users adapting to the available collection. Some of us did it out of a sense of childish excitement and some of us, I think, did it for a kind of excitement that was altogether more adult if perhaps less healthy. They’ve called us fascists and they’ve called us perverts and while there’s an element of truth in both those accusations, neither of them are big enough to take in the whole picture” (p. 8). While Nite Owl was describing these heroes who dressed in costume to stop crime, he could easily be describing criminals. Especially in post-modern comics, we seem to see the duality of villains and heroes and how close to the edge of justice and injustice they both live. I wouldn’t be surprised to learn that these consistent themes are what appeals to the patrons of Ephraim’s library where they wrestle with the same moral questions about themselves. Moore, A., & Gibbons, D. (1986). Watchmen. New York, NY: DC Comics. I can’t say this with any certainty but Owly has the feeling of being written for school-aged children. The pictures are sweet and the text is minimal but the stories themselves seem to have a moral impetus driving them….like you just know there’s a lesson at the end. Andy Runton even includes this teacher resource page on his blog: http://www.andyrunton.com/teaching/in… …as if Andy Runton sat down one day and said “I have the perfect thing for those elementary teachers…” The pictures are sweet and the text is minimal which is certainly an achievement but the stories themselves seem to have a moral impetus driving them….like you just know there’s a lesson at the end. This makes the stories seem disingenuous and I have to question the validity of the purpose. However, there is a very nice storytelling moment when during their quest Owly and Wormy meet a pair of fireflies to light their nighttime path. The reader realizes that Owly released these two fireflies from a jar earlier in the story so they are repaying a favour to Owly. And another thing….While I mostly like this cute character Owly, I’m a little miffed when in “The Way Home” that he can have worms as friends, because I think any owl with any self-worth would munch on that worm quick as can be. Owly just isn’t very ….owly. My son was given a book called “Ducklings love…” once when he was about 3 and it was super cute that the ducklings love something different on each page like: water, swimming, their Mommy and Daddy, and then the ducklings were said to love cats and dogs and I thought “Ducklings do not love cats and dogs or rabid-duckling-eating-wolves” and I threw it away. There’s something about Owly’s quirky relationships with much smaller animals that I find unnerving. Maybe the leap from personifying an animal to taking all of his animal characteristics away is just too great for me to take. I appreciated “The Bittersweet Summer” a little more because of the natural cycles of migration that Owly discovers. I particularly enjoyed the pages where Runton conveys time passing through the calendar and the plants are starting to bloom again. Runton’s use of black and white does not diminish the emotions he’s trying to convey through Owly’s expressions. Only occasionally does Runton break his style to provide a whack of information regarding a plant or the hummingbird’s migration patterns in writing. The structure of the frames on a page is generally reliable and this would be comforting to a new reader of the comic genre. Our need for resources to help the struggling reader has become urgent. A component that has yet to be found is any software that would support reading improvement in teens. I would like to use the model of Raz-Kids (2012), a levelled software program for elementary students, that is online. To improve on the Raz-Kids model, the software should be adaptive to the user and increase in difficulty as the student shows readiness. Teachers subscribe and create a class account and then give each student an account which is accessible from any internet connection. I would then advocate that the software become part of our image through our catalogue and online subscriptions database. Software in general is best catalogued in our school using the title as an access point. Educational print resources seem much easier to locate, and general software is easier to find. Combining both the ideas of educationally designed and digital resources was complicated. Adding in the specificity of the age group of our struggling readers, was a further challenge. I relied heavily on Chapter 6 of the Bishop (2013) textbook for guidance in how to maintain focus. Most review sources focused heavily on elementary students and often they simply lead me to the companies that made the software to see if a secondary school program had been created. The databases at the University of Alberta library lead me to three review sources. Then I focused on two strategies of web searching using government bodies of licensed software and iPad apps. I was first turned on to the idea of scaffolded reading software when my son, Max, came home with his Raz-Kids (2012) software login in September 2012. Then I discussed the program with my colleague, Rita Baran, who is piloting a reading recovery for grade 9 students. Rita’s success has seen students improve by up to 4 reading levels in one semester which gives the students tremendous confidence about their other classes. Next I visited my colleague Maddie Davis, who works with a Transitions Skills class. Maddie visits the library weekly with her class to investigate new reading materials. They read in the library and both Maddie and I are interested in other ways that the library can be used to support this group of students. Finally, I visited my colleague Deb Schaner, the Head of Student Success, who deals with our most at-risk students. Deb’s greatest challenge is identifying and supporting students as they enter our school. Research into types of resources for each of the aforementioned populations of students, and to help these colleagues, is a necessary but challenging prospect. The ISTE Journal of Research on Technology in Education “publishes articles that report on original research, project descriptions/evaluations, syntheses of the literature, assessments of the state of the art, and theoretical or conceptual positions that relate to the field of educational technology in teaching and learning” (2013). Very often, the articles chosen review pieces of software in relation to a teaching or learning challenge. “For over 30 years, Tech & Learning has served the K-12 education community with practical resources and expert strategies for transforming education through integration of digital technologies” (2012). Tech & Learning focuses on successful implementation of information technology in educational settings. It not only talks about software for learning, it recommends strategies for teaching. Published six times per year, Teaching Exceptional Children focuses on practical methods for teaching children with the full range of exceptionalities. Reviews of software happen in the context of articles exploring successful implementation of teaching strategies for this specific group of learners. OSAPAC is “the committee that advises the Ministry on software titles to negotiate for provincial licensing” (2013). Besides their role as advisors, the committee maintains a website with an excellent searchable spreadsheet of licensed software. Licensed under the Creative Commons, iEAR.org is dedicated to collaborative contributions from educators and students on the effectiveness of mobile applications for education. Although the responses aren’t based on formal research, the variety of contributions in the form of blogs, wiki discussions and community discussions is like a consumers report from multiple perspectives. Scholastic. (2013). Read 180 Instructional Software [online]. Scholastic. Read 180 meets many requirements of the ideal software for teenage struggling readers. It is online, adaptive, and comes with print materials and professional support. It is working on multiple platforms including ebooks and audiobooks. Reading Assistant is for students who are building fluency, comprehension skills and vocabulary. The software listens to the student read aloud and helps with prompts when difficulty arises. The program maintains records to monitor progress for the student and teacher. software on CD-ROM]. Markham, Canada: SVT Education Services Inc.
Reading & Writing Achievement is designed to improve reading and writing skills of grade 10 students in Ontario who are about to take their mandatory literacy test, or to help improve the skills of students who have been unsuccessful in previous attempts. It is licensed for all public schools in the province of Ontario through OSAPAC. Merit Software. (2013). Reading Skill Builder [Online]. New York, NY: Merit Software. Reading Skill Builder is one choice of many from Merit. It is designed to target reading in the late elementary levels but with high interest material suitable for teens to adults. MindPlay Educational Software for Reading Instruction. (2013). RAPS 360 [Online]. RAPS 360 – Reading Diagnostic software uses a variety of tests to quickly determine a baseline reading level of students. It can then recommend groupings of students based on commonalities including comprehension and vocabulary. It can easily print reports, track progress and make recommendations for interventions. Previous MindPlay products have won numerous awards including those from the Council of Exceptional Children and the International Society for Technology in Education. Bishop, K. (2013). Selection. In Library and Information Science Text Series: The collection program in schools: Concepts and practices (5th ed., pp. 45-70). Santa Barbara, CA: Libraries Unlimited. Learning A – Z. (2012). Raz-Kids [Online software]. Tucson, AZ: Learning A – Z.
Bibliographic entry World Almanac Books (Ed.). (2013). The world almanac for kids 2013. New York, NY: World Almanac Books. Description This almanac is filled with pictures and facts. It highlights popular culture in the year 2012 and is organized by topic alphabetically from animals to weights and measures. Reaction It’s very visually dense and the index is comprehensive. Although it is the ‘world’ almanac, it is still very focused on the United States. Miscellaneous Dense non-fiction books like The World Almanac are very popular with struggling readers in my secondary library. I would purchase The World Almanac, not the one ‘for kids’.